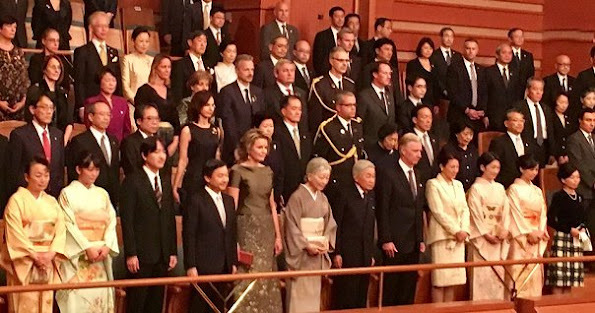 King Philippe and Queen Mathilde of Belgium, Japanese Emperor Akihito and Empress Michiko, Crown Prince Naruhito, Crown Princess Masako, Fumihito, Prince Akishino, Sayako, Princess Nori, attended a concert hosted by the Belgian royal couple at the Kioi Hall in Tokyo on October 13, 2016. 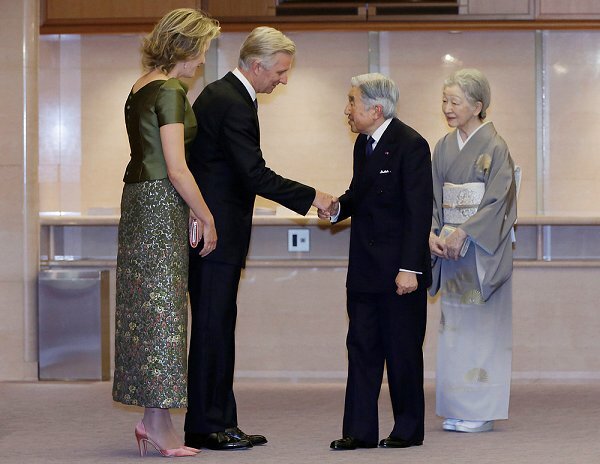 The Belgian royal couple is on a state visit to Japan. Queen Mathilde outfit in beautiful colors together even with the color of her hair. But I do not like color of the shoes and bag. Shoes should have been in color of her top and then it would have been perfect all. I wonder if Queen Mathilde selected this dress knowing that some of the Japanese Imperial ladies would be wearing kimonos, and the silhouettes would be somewhat similar? It looks nicely coordinated but not overly matchy. 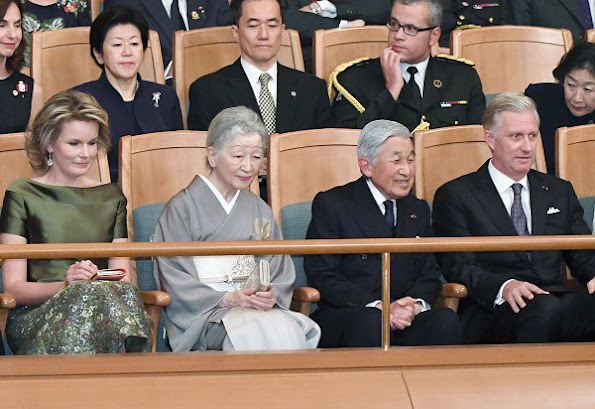 I love seeing the kimonos; they are beautiful! That dress is a very bizarre length. The shoes and bag are of one of the colors in the skirt but they don't really go well with it. Yes I agree with you .The skirt being straight line should be a bit or more shorter. If the shoes were the color of the top then it would look much better with longer length . I like this look very much! I am even ok with the length. 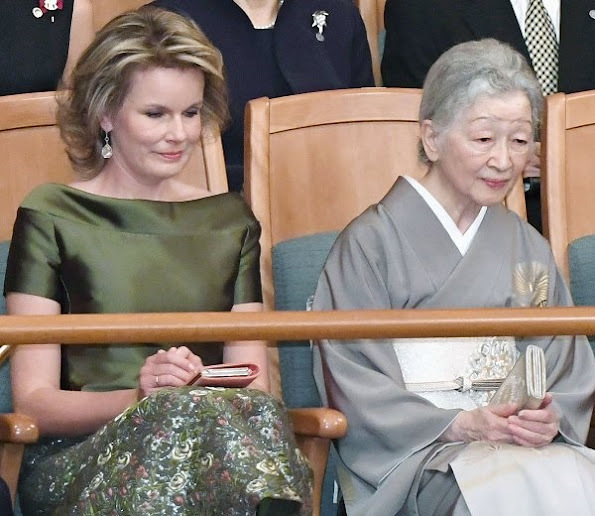 The colors and fabrics used on her dresses all have an oriental look to them. A very nice and diplomatic touch! The picture of the two 'gals' chatting is very sweet. Actually the shoes and bag match a colour in the skirt. Therefore, both are a perfect choice. 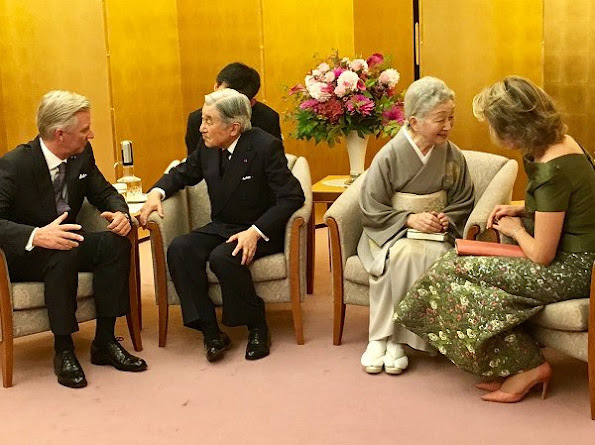 I also very much like the kimonos, especially Empress Michiko's which is of extreme elegance. Such elegance, attuned to the particular environment. 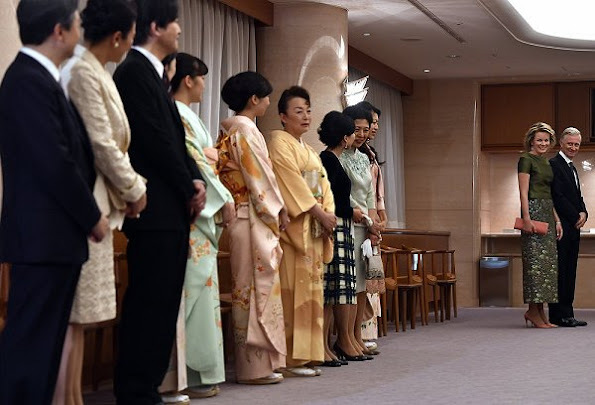 Perfect length, respectful and similar, but not identical, to the kimonos. Exquisitely subtle color of shoes and bag picks up lush coloration of skirt. Warm and appealing connection to her Empress host. Mathilde is truly in a class of her own and suited to being a queen. The fabric of the skirt is incredibly beautiful. But a full length skirt would have been better. 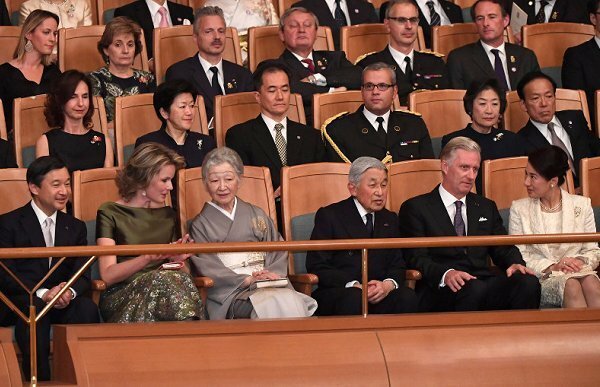 Nevertheless, a lovely outfit, Mathilde looks great. 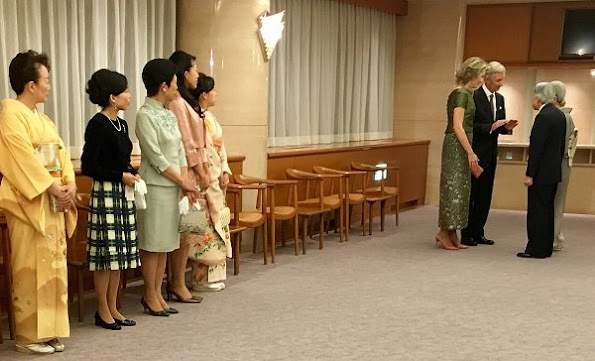 mathilde, is looking better and better each day, elegant, she looks healthy, I dont want to seem bones and short skirts on royals, they look trashy!!!! OK LIsa ,trés beau look .Si les chaussures et le sac avaient la même couleur que le top ,certaines auraient trouvé cela triste .Le sac et les chaussures ont un accord délicat avec le tisssu de la jupe . I agree Kristina, those shoes just don't seem to go well with the (otherwise quite lovely) outfit. 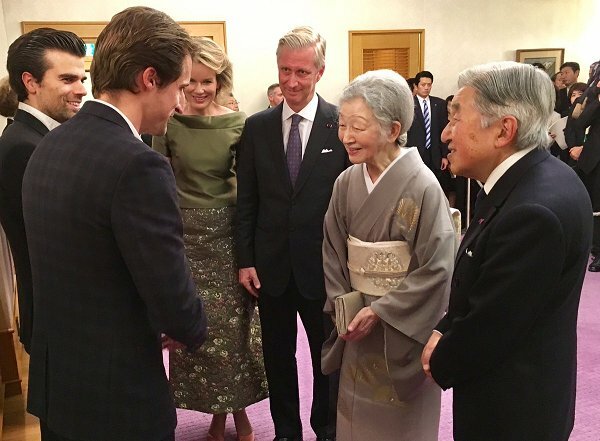 The Empress' kimono is a wonder. Dove grey with gold! Breathtaking. Perfect colours of the shoes because the green top is not very uplifting. In television that colour is impossible. The green of the outfit is lovely on her! The shaping of the top, is one of the nicest I've seen ! The skirt is an awkward length, a longer length might have been more appealing. Strange length. Looks like Mathilde is wearing someone else's skirt, not her own. Lovely colour.